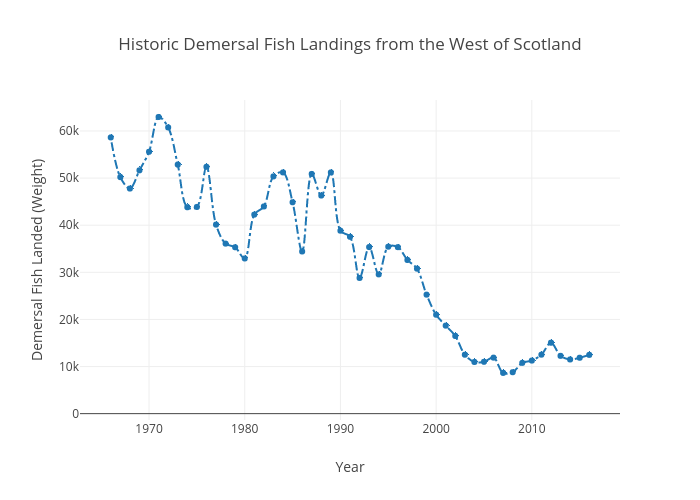 Openseas's interactive graph and data of "Historic Demersal Fish Landings from the West of Scotland" is a line chart, showing Total Demersal Landings; with Year in the x-axis and Demersal Fish Landed (Weight) in the y-axis.. The x-axis shows values from 1962.9726913402803 to 2019.0273086597197. The y-axis shows values from -1350.7392878636892 to 66575.20758638608.